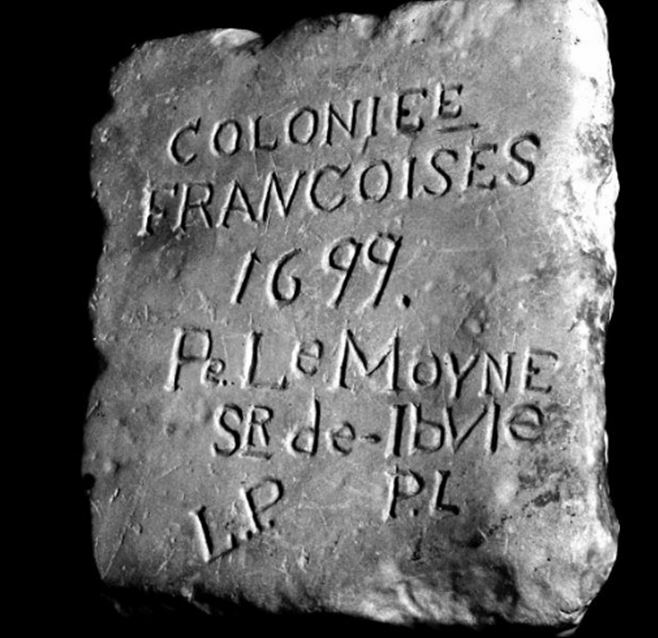 The above black and white photo​ on the left is the marble marker placed by d’Iberville to mark the 1699 location of the new French Colony and a color photo on the right. The middle photo shows the marker ​surrounded by pieces of marble and stone that are believed to have come from the early Colony on Biloxi Bay. 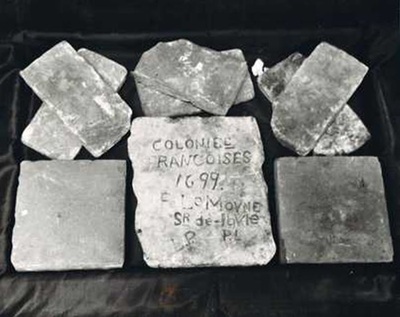 These are displayed in the museum at the Cabildo in New Orleans. 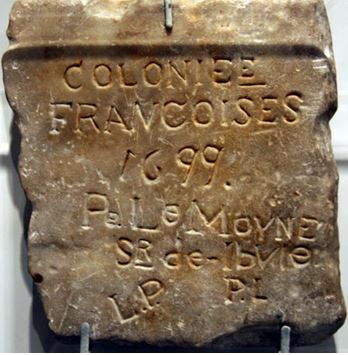 The 1699 d’Iberville Stone, pictured above, is a chunk of marble that is basically signed by d’Iberville himself. It is displayed at the Louisiana State Museum at The Cabildo in New Orleans. 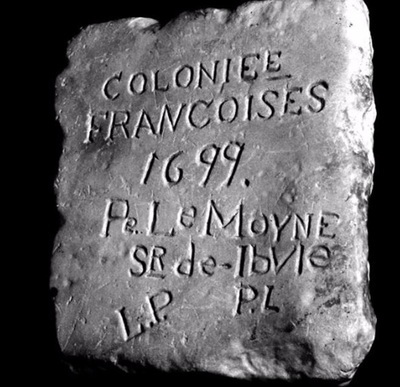 It’s believed to be a marker placed by the French explorer at either Fort Maurepas, the first French settlement of the Louisiana Territory, then called Biloxi, now the location of the city of Ocean Springs, Mississippi or perhaps on the wharf extending into the gulf in front of the fort. It was unearthed in 1910 by a grounds keeper at the W.B. Schmidt summer home on Front Beach in Ocean Springs. 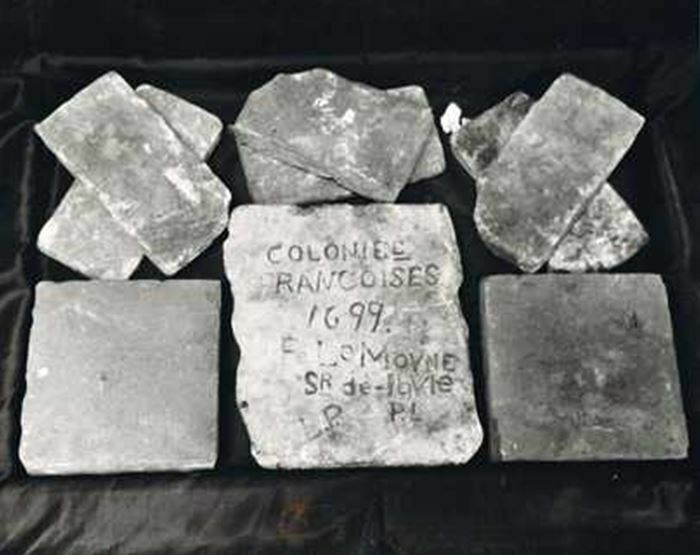 In the 1930s, the Schmidt family, which hailed from New Orleans, presented it to The Cabildo in New Orleans for safekeeping. Testing revealed it is made of a marble that is generally found in France and was used as ballast in French ships.